While searching for old stone column photos being turned on lathes, I found a stone quarry and stone works page with some interesting photos. 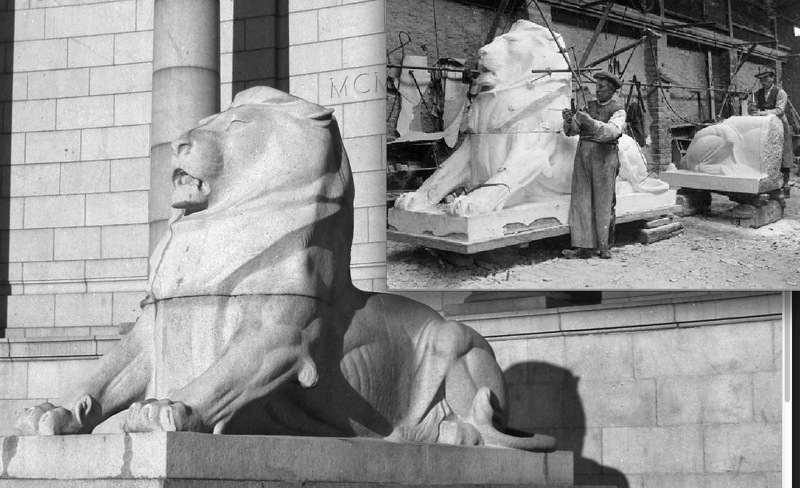 One photo was of a couple of carvers working on a stone lion in the UK about 1925 for a war memorial, wondering about the finished product I searched and found a pic of the granite lion in place. 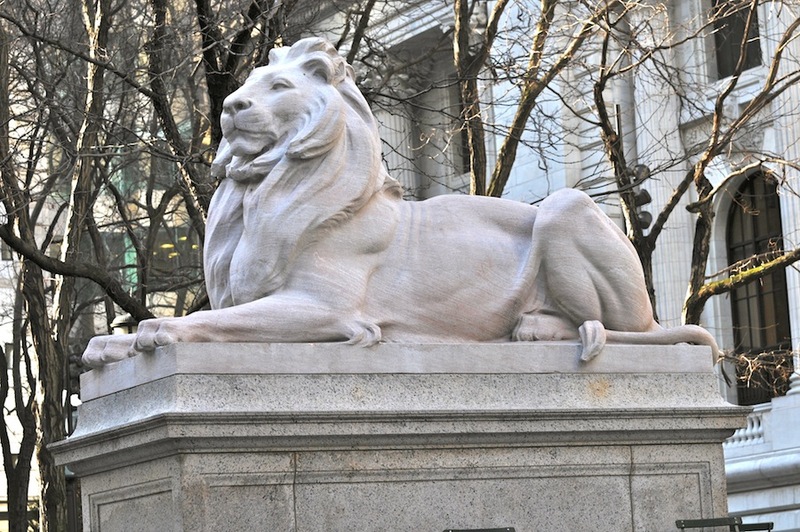 Interesting is how it was made in 3 pieces instead of the single pieces the pair of lions this size were made for the Public Library in NYC. The old photo shows them using a pointing machine. The carver in the rear is matching up his end of the pointing rod to his carving, the full master model was probably plaster. The carver in the rear was working on the rear half of the lion, which on the modern view of it the seam line down the midsection can be faintly seen. The head's separate section can be clearly seen in both pics. The actual artist W. McMillan died at age 50, just 2 years after the lion was installed, odd thing is with these famous sculptors- they didn't actually do much of their own carving at all, they simply handed that over to studio assistants or in this case- a firm who did the carving for hire, so then is the sculpture REALLY his work at all, or is it actually the work of these two quarry carvers James Philip, with his assistant George Cooper!? The carver, James Philip, spent his working life in the granite yard of Arthur Taylor granite works, and he was perhaps the best carver ever employed in the City’s stone trade. Nonetheless, it was McMillan who claimed all the credit for the sculpture even though he clearly had no actual hand in the physical carving of the granite block himself. Great find! It's pretty common these days for "name" artists to have their actual work done by anonymous hands. Look at the ads in Sculpture magazine; there are many fabricators and foundries offering to take your model or even your sketch on the back of an envelope and transform it into a towering monument. Artists who've really struck it rich, like Damian Hirst or Jeff Koons, have "factories" filled with artisans cranking out "branded" work, that gets signed and sold with the master's name on it. It depends on your definition of art and of artist. I take issue with classifying Jeff Koons as an artist. As a promoter (snake oil salesman) he is without equal, but as an artist . . . ? He is appropriate to our age, in which the cultured and the educated no longer rule, but the unethical and crude have taken full control. Men of the likes of Andrew Mellon and J. P. Morgan have been replaced by such men as Donald Trump and the Koch brothers. God help us. I guess if you are in it as a business, and you have limited talent, you have to sell your soul in order to make it. I am not sure about my ability as an artist, but I am sure that I have never, and will never, put my name on another man's work. I'm not sure about your choice of heroes; Mellon was the father of trickle-down economics, which worked great for him - until they led us into the Great Depression. Morgan was the leading monopolist of his time; he did his best to corner the markets in steel, railroads, banking and transportation in general, until his wealth was equal to that of half the country. But both were great collectors of art, which is more than I can say for their latter-day successors. We could have a whole thread on the difference between an artist and an impresario, I suppose, but Koons, like him or not, does put himself forward as a producer of art, and so, like Duchamp's urinal, should be accepted as a "ready-made" artist. What would you do if called upon to produce a giant sculpture in an unfamiliar material - would you really insist on doing all the work yourself? I would give credit where credit is due. If I (Richard) conceptualized it, and four stone cutters (Rafael, Emil, Hank, and Martin) carved it, then the only proper thing would be for the five of us to sign it. Granted, you have to stop somewhere—the guy who swept up the stone chips every evening would not get any billing, but not to acknowledge and reward the people who actually made the piece, just because I am a promoter and they are not, is just plain sleazy. That said, the fact that we live in a society that rewards sleazy promoters over honest workmen requires that we not be stupid and that we watch our backs at all times. A few years ago I used a specialist welder to do some welding for me on a sculpture that included titanium parts. He not only welded but wanted to give me some of his ideas about the design of the construction and the form of the work. He was an excellent welder, but his aesthete was very different from mine. So, I pressed on with my own design, and at the finish he wanted to be able to sign the piece along with my signature. Here is what I said. I have never seen a Ford automobile running down the road with everyone’s signature on the frame, finders, top or windows. One sees only a bright and shiny FORD logo representing the production. From Peter Paul Rubins to Andy Warhol no artist works alone. Even primitive tribes have to rely on others for production and most importantly the greater the technology the more we rely on others for our final vision. Yes, my point exactly. In our world the promoter (snake oil salesman) gets all of the credit and almost all of the money. Probably the same set up, in modern clothes, as the old feudal baron in his castle, owning everything and everyone who lived nearby. Of course communism is the same thing, just with a different ideology and a nastier set of thugs taking everything for themselves. I don't know how welcome this would be. The anonymous carvers aren't working for the glory of it all; they basically want a paycheck. They might also want their name on whatever you hire them to produce, but it's just as possible that they wouldn't want to be associated with it, if it doesn't fit in with their own aesthetics. Often an artist (and we can assume that at least some of these folks are artists in their own rights) wants to present a coherent body of work to the world, not have his/her signature on all sorts of miscellaneous things they may have put their hands on. The purchasers of the work are paying for the "name" artist, not for the names of various assistants. If a piece is signed "Picasso and Joe Blow" would it be more or less valuable than if it was just signed Picasso? Damian Hirst famously hires people to produce his Dot paintings whom he's ascertained have no talent at painting (evidently, he feels they'll interfere less with his conception); if you'd paid the big bucks for a Damian Hirst (TM) painting of dots, would you want it signed by him, or by the actual person who painted it? If that was you, would you be happy to be thus certified as talentless? You have a good point there Andrew. I would not want my name associated with a lot of what passes for art today.